In recent years, the number of books about shapeshifters, werewolves, ghosts, and other extraordinary characters has multiplied. 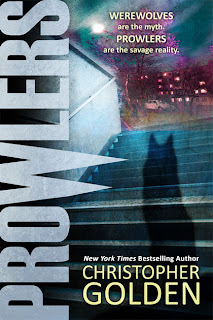 If you're digging through all of these series in search of your next read, look no further: Prowlers by Christopher Golden has been republished! Get all four books now! At age nineteen, Jack Dwyer's best friend Artie is murdered. Not by humans, but by Prowlers, a group of ancient creatures whose handiwork is typically thought to be that of wolves. But these are no wolves. They are animals, but their ability to think, their emotions and their need for revenge makes them as cunning as humans. Jack, as well as most of America, knows nothing of the Prowlers... That is, until Artie travels from the Ghostlands to tell his friend what truly happened. Prowlers is positively riveting and inventive. Before the book was through, I was captivated by the villains, connected to the protagonists, and yearning to go on the prowl again. Luckily, Prowlers is the first of a quartet of novels, so I could continue the journey with Jack and company through the other books. Of course, when the fourth and final book came out, I pretended it wasn't the last book. It couldn't be. As soon as I turned the last page, I felt the need to read all four books again. And again. When nineteen-year-old Jack Dwyer's best friend Artie is murdered, he is devastated. But his world is truly turned upside down when Artie emerges from the Ghostlands to bring him a warning. With his dead friend's guidance and the help of the one person who doesn't think he's insane, Jack learns of the existence of the Prowlers. Under bold new leader Owen Tanzer, the Prowlers, already eight packs strong, have united. They move from city to city, preying on humans until they are close to be being exposed, then they move on. And unlike werewolves of legend, they aren't human beings whom the moon transforms into wolves...they are savage beasts masquerading as humans. Jack wants revenge. But even as he hunts the Prowlers, he marks himself -- and all of his loved ones -- as prey.